It was an outstanding property. It’s five star plus all day long. The people who take care of you are rt there always. Dimitri and his family and staff beat them all. The staff was amazing and the food they prepared and the restaurant staff were perfect. 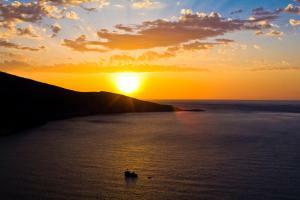 Crete is astounding and you will be very happy here in all ways. The staff at the happy Cretan was very accommodating. Dimitri was very helpful and worked constantly to help you. Service was incredible. The staff woke up at 4:45 am to let us into our room since we arrived on a red eye flight. I can't say enough about how helpful and awesome the staff was. Dimitrius went above and beyond to make sure we had a comfortable stay. They knew it was our honeymoon and left us a little cake and bottle of prosecco as a surprise. Room was large and comfortable. Views from the hotel are amazing. Breakfast was excellent. Would 100% recommend. Stayed here for 2 nights with my boyfriend and we had a lovely experience. Very nice and accommodating staff. The restaurant serves really large portions of authentic greek cuisine. Gorgeous views. Close to some great beaches. Staff was really friendly and helpful. Good food in the hotel restaurant in very good price. Quiet and relax place to chill out. The hotel is beautiful and clean. The pool big and deep but without lifeguard. The room was also big and clean with beautiful view. We also received a smartphone with free international calls and 4G Internet. You can also rent mountain bikes for free. The breakfast was tasty and you can order a nice fresh omelette. 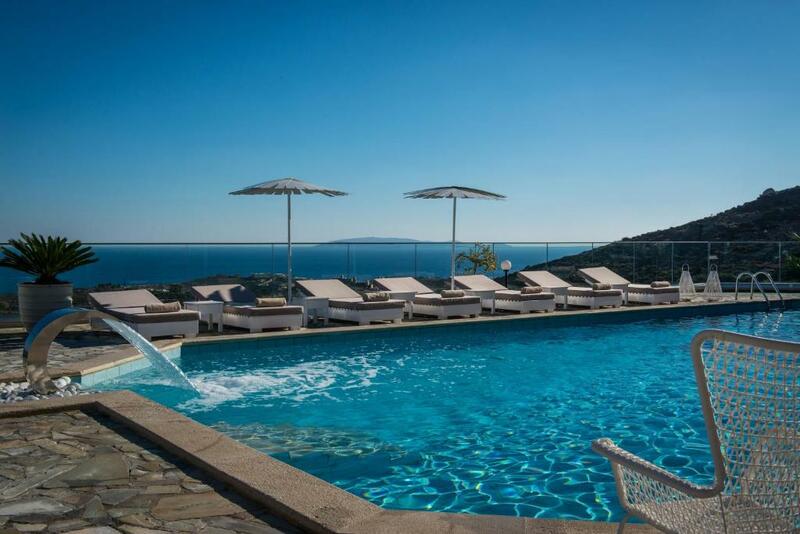 Lock in a great price for Happy Cretan Suites – rated 9.5 by recent guests! 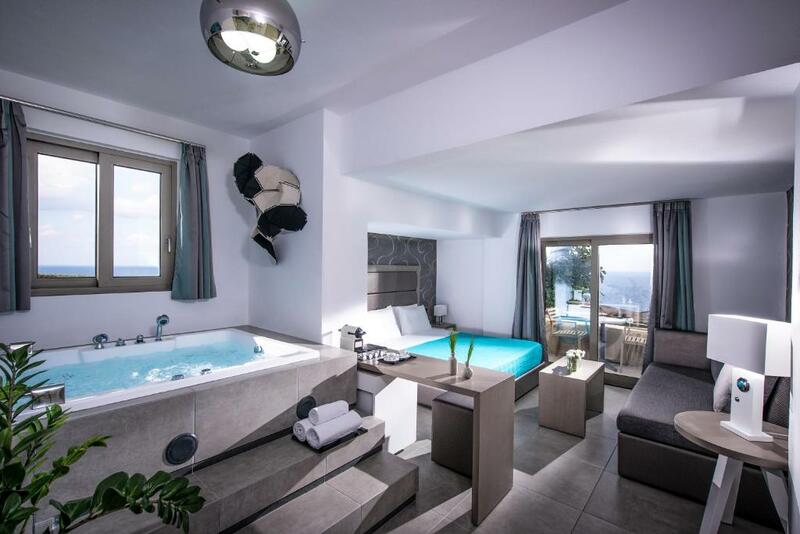 Happy Cretan Suites This rating is a reflection of how the property compares to the industry standard when it comes to price, facilities and services available. It's based on a self-evaluation by the property. Use this rating to help choose your stay! 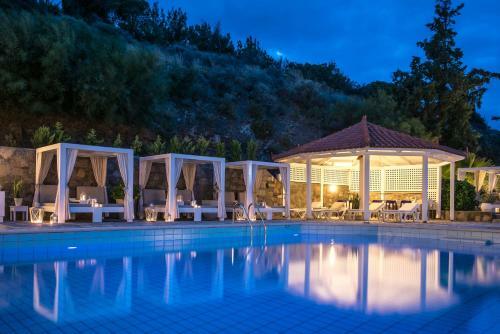 Located in Agia Pelagia resort and just 0.9 mi from its 3 beaches, Happy Cretan Suites have panoramic Stavros Bay and Cretan Sea views. Featuring a seawater pool and whirlpool, they offer tastefully decorated accommodations with free WiFi. Opening to a private balcony with Cretan Sea views, all air-conditioned and modernly decorated units at Happy Cretan come with elements of the traditional local architecture. Each has a flat-screen, satellite TV, mini fridge and electric kettle. The private bathroom includes a hairdryer, free toiletries and makeup mirror. Some accommodations types are stone-built with a slanted ceiling and some are fitted with an indoor or outdoor hot tub. A traditional buffet breakfast, enriched with homemade sweets, can be enjoyed daily. Greek and Cretan dishes are served at the on-site restaurant by the pool. The poolside cocktail bar prepares refreshing drinks and light meals. 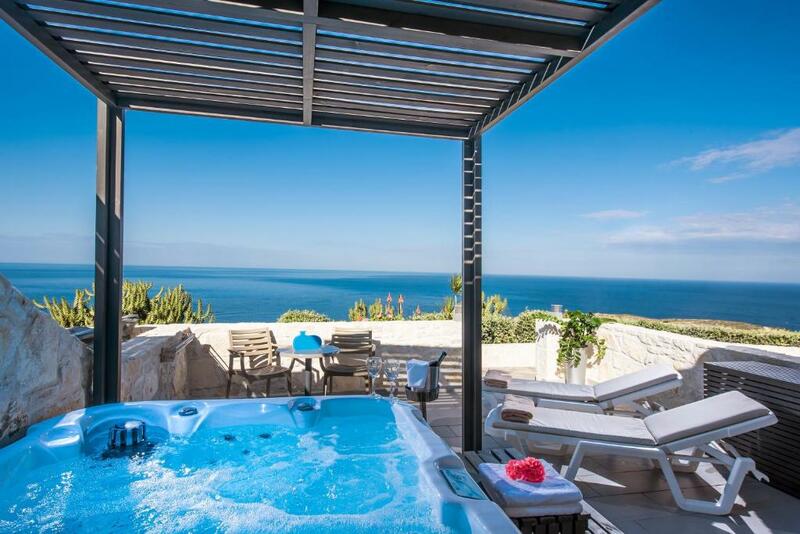 Guests can relax in the outdoor hot tub or on the sun loungers by the pool and enjoy the panoramic views over the Cretan Sea. A sea-view fitness center is offered, while massage treatments can be arranged upon request. Free WiFi is available throughout. Nikos Kazantzakis International Airport and Heraklio Port are 14 mi away from Happy Cretan. The Museum of El Greco is at a distance of 5 mi and the archaeological site of Knossos is 17 mi away. A bus stops just right outside the property. Free parking is possible on site. 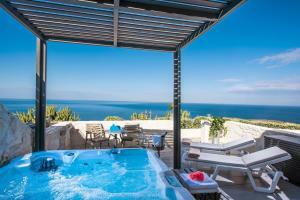 When would you like to stay at Happy Cretan Suites? - a bathroom with bathrobes,slippers and free toiletries. - a bathroom with a rain shower, bathrobes, free toiletries and slippers. Please note that the spa bath can fit maximum 1 adult. 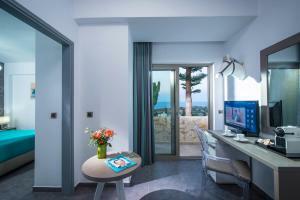 Featuring modern décor, this air-conditioned mini suite opens to balcony with Cretan Sea view. It comes with a Nespresso coffee machine, free WiFi, a satellite, flat-screen TV, hairdryer and a bathroom with a rain shower, bathrobes,hairdryer,free toiletries and slippers. - a bathroom with a hairdryer, bathrobes,slippers and free toiletries. -a bathroom with bathrobes, free toiletries and slippers. Our hotel aims to set new standards for personalised service in Crete, starting with our customer-oriented check-in from the moment you arrive. The concierge team charged with helping you explore Crete like a local, to our family-friendly approach and facilities, we try to provide a tailor-made service for all our guests. House Rules Happy Cretan Suites takes special requests – add in the next step! Happy Cretan Suites accepts these cards and reserves the right to temporarily hold an amount prior to arrival. Please note that the swimming pool has brackish water (chlorine-free). Please note that the remaining balance of the guests' stay is due upon check-in. Kindly note that the dinner rate does not include drinks. Please inform Happy Cretan Suites of your expected arrival time in advance. You can use the Special Requests box when booking, or contact the property directly using the contact details in your confirmation. The view, very nice and helpful staff who did everything to make us feel welcome, big nice rooms, the outdoor area, sculptures, very good bikes for free. Homemade cakes at the room in the afternoon.Eyerything!! The hotel is really cozy and chill. The people who work there are the kindest you can imagine. Every day we found a small gift in our room. The hotel is all about great details. Conclusion: soooo wonderful!!! We had the best time there! The hotel is 20km for the airport and there is no shuttle bus service, so a rental is a must. Excellent location, great views, fantastic staff, clean rooms and great salt pool. Very generous breakfast and surprised with complimentary champagne and daily afternoon tea local treats. The best place we stayed in Crete. Everything was perfect: room, staff, food, everything very good :) Thank you!! !